At the centre of our organisation is a law firm composed of lawyers with vast experience in various areas of law. Apart from the legal services provided through our law firm, we offer additional services via a fully licensed fiduciary services company and a general services company. We identify strongly with our heritage as legal professionals which guarantees the high ethical standards which are obligatory within our profession. Our organisation has evolved following the merger of the legal and corporate service practices of the three founding partners - Tanya Sciberras Camilleri, Reuben Balzan and Mark Bencini in 2009. It has since expanded rapidly and has grown into a one-stop-shop destination for clients requiring legal, corporate and financial services. We operate from Valletta, Malta's capital city and the economic hub of the Maltese Islands. Our team is composed of a number of dynamic and experienced professionals who practice in various fields, providing multi-disciplinary services to a wide array of clients, based both locally and abroad. We strive to assist our clients in the most professional and efficient manner possible, thus enabling us to guide them on whatever legal issue they might have, whether it's settling an inheritance, protecting one's intellectual property, registering a vessel, or taking a company from its legal formation to its ongoing maintenance and management. We encourage you to utilise our service search function at the top right hand corner of this page to be immediately directed to pages of interest. Valletta Legal is at the heart of our organisation providing consultancy services and representation to international business executives, private and public companies, governmental authorities, banks, entrepreneurs, investors, as well as individuals. 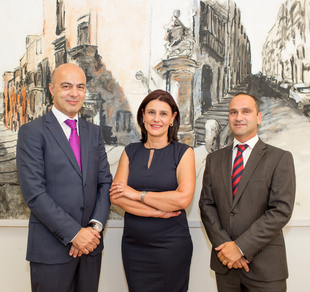 Valletta Trustees Limited is established in Malta and is duly licensed by the Malta Financial Services Authority (MFSA). By virtue of the said licence the company is permitted to offer a complete spectrum of trustee and fiduciary services to local and international clients alike. Valletta Services Limited is our general services vehicle that complements the law firm and trustee company. We have developed a one-stop-shop approach, whereby clients can avoid hopping from one authority to another and from one service provider to another and simply leave the filling up and chasing of all applications, forms and other requirements to us. myEUfunds is focused on assisting organisations, whether private or non-for-profit, in grabbing the opportunities offered through European and local funding. It is a boutique agency specialised in funding consultancy. Looking@Libya is a dynamic and fast growing consortium between two Maltese law firms. IURIS Malta and Valletta Legal collectively strive to transform our client’s business ideas into products and services for the North African market.